While working towards a Bachelor’s degree in Art at Truman State University, Alexandra Olson spent a semester in Scotland learning about jewelry-making and immediately fell in love. After returning home, she ended up transferring schools to pursue a degree with a concentration in metalworking. The idea behind her company, Enigma Enterprises, also started in college. Prior to attending a Harry Potter-themed event, Olson and her friends made their own basic wands using hot glue but when handled too strongly, they began falling apart. The wand-making design process can vary as each wand is individually created, but Olson often tries to take on the “form language” found in nature so the wands produce asymmetry found in objects such as geodes and flowers. She is also inspired by the elements of nature: wind, fire, sea and air. 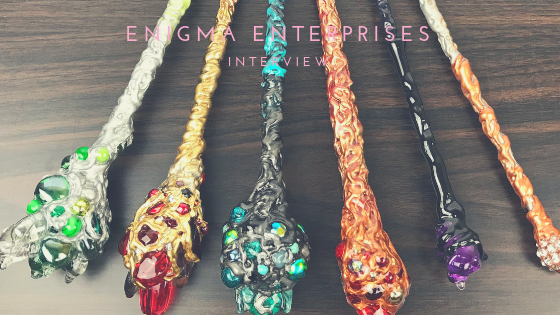 The wands are created in large batches, so the process can take up to three hours designing, painting, and setting the beads, crystals and stones. Adding resin takes much longer, adding up to three additional days due to being able to only coat half the wand at a time. In addition to wand-making, one of her other favorite designs to create are wand holsters. Leather-working has been a new addition to her skillset, and her design to make the holster adjustable is something she’s proud of. She has been featuring her wands and other creations at comic convention booths, including Wizard World. She’s been able to not only display her creations for such an eclectic community, but she’s been able to create lasting relationships with her customers. What started as a one-time thing became a much larger production for Alexandra Olson. As she continues to create one-of-a-kind wands, she continues to fall in love with creating art that people can hold and use.